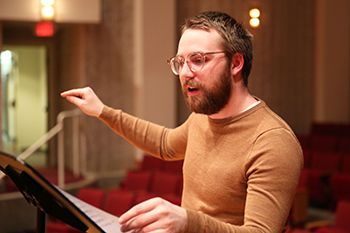 Nathan Muha ’18 is a double major in music, with a composition focus, and theater, with a playwriting focus. Instead of trying to complete two different senior thesis requirements, Muha decided to put everything he’d learned into one big project. He wrote an opera. 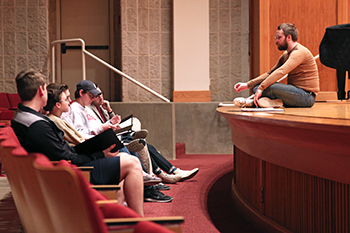 After a year and a half of work, ‘A Memory of Two Mondays’ was performed in Salter Hall on Friday, April 27. A: I figured that it would be less work to combine my two projects into one. (laughs) That was stupid. Absolutely not the case whatsoever. I’ve always loved opera. It’s something I grew up with. It’s not something my family listened to, but Jared Cottingham ’18 and I have been best friends since we were five years old. He introduced me to opera because he’s a classically trained vocalist. It’s sort of funny – he introduced me to opera and then performed in my own. Q: How did you decide what your opera was going to be about? A: I didn’t want to write an original story because I knew that would be too much from the get go. It was fall of my junior year, and I really wanted to base it off of an American play. The first thing that came to mind was Arthur Miller’s A View from the Bridge, which actually has already been made into an opera. Q: Did you keep the text exactly the same or did you make any changes? A: I wanted to figure out the best way to keep the character of the piece while updating the language. There were these idiomatic phrases I thought had to change because no one says them anymore. But the biggest change came from what is now the character of Alano and what was the character of Kenneth. In the original play, Kenneth is an Irish immigrant in Brooklyn in the 1930s, and here are xenophobic interactions that happen throughout. When I was thinking of making it more pertinent to today, things that might work, I thought of the significant Hispanic population around where I grew up. And, unfortunately, racism and xenophobia were pretty rampant. So I decided to make the character of Alano, a Mexican immigrant. Writing that character, it was strange to see how little of the text I needed to change to make it relevant. That was hard to deal with. If the original characters called Kenneth a racial slur toward Irish people, I had to replace it with a racial slur toward Mexican people. I had to realize what I was doing was trying to tell the truth of the situation and not trying to sugarcoat it. That didn’t make it any less difficult to type out onto a page, but it was important I represent that accurately. Q: Who was the first person you told that you wanted to write an opera? A: The very first profe ssor I told was (Associate Professor of Theater) Jim Cherry. He was immediately excited and told me to flesh it out and then make a formal proposal. The second person I told was (Associate Professor of Music) Peter Hulen. He was a lot more apprehensive because he has a more technical grasp on everything that goes into making an opera. He just didn’t want me to be completely overwhelmed. Those discussions turned into a formalized plan of how I was going to write it and how long it was going to take. A: Every day. Every single day. From the time I started my junior year until last Friday. I was just like, ‘Oh my god. I’m so stupid.’ But I’m really glad I did it. Q: Did people ever look at you like you were crazy when you told them you were writing an opera? A: Yeah, sure. But that happens everywhere. Whenever someone tells me about the chemistry project they’re working on, and they give me the name of a paper that has a 15-word title, I look at them like they’re crazy! It’s the same sort of reaction. But I was really taken aback by was the support of my classmates. When I told them I was writing an opera, they’d be like, ‘Oh wow! That’s really interesting. Tell me about it.’ And that forced me to articulate my thoughts about it. But I was able to gauge that interest and think about an actual performance. Would it be worth going through the hassle of a performance? Would people show up? And they did. Q: How do you feel now that it’s over? A: I feel really good! I feel proud of the accomplishments I’ve had, and it feels so much more real. The opera has always been this sort of metaphysical thing floating in space that I’ve always talked about but now it finally feels like this real concrete thing that exists. 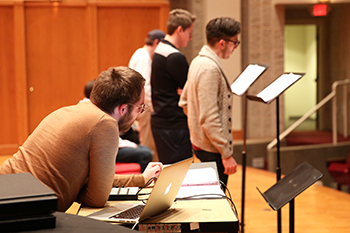 Q: How do you think Wabash helped prepare you for this kind of large-scale creative process? A: Professor Hulen and Professor Cherry gave me guidance throughout the entire process. There were moments when I would go into Professor Cherry’s office and be say, ‘I need to get this funding. Can you give me options?’ And he’d tell me what I should do. Wabash also prepared me to send as many emails as I did. (laughs) I’ve gotten very good at sending e mails here at Wabash, and I had to send many in order to get people to end up performing and supporting this. But also, there’s the aspect critical thinking. Being the sole organizer as well as the creative entity, I had to be able to look at everything objectively. I had to tell myself it couldn’t be a full-fledged production with professional opera singers. But I think I was able to manage something that’s still impactful, special, and creative while maintaining practicality. You have to be able to know your limitations and work within them, and Wabash prepared me for that. Q: What advice would you give to another student who has a wild idea they want to pursue? A: Go for it. But make a plan. And then expect that plan to be completely different by the end of the process. You always have to be open to adaptation. You always have to be open to making things work, no matter what your expectations were. Because the most magical parts of doing a big crazy project like this are the unexpected things that happen along the way.